I liked the Europe version for The Blue Bomber because I am an European. A Blue Metal Hero sounds weird to me but maybe it is not because I am not an American. I don't even know where that "Blue Metal Hero" title comes from, other than it being similar to the subtitle for Rockman 8. He's widely known as "The Blue Bomber" in America, as well. I don't have the game, but I really hope this gets patched, too. And WHY is he not called the super fighting Robot in the west? VERY good point, that's better than either of these names! Blue Metal Hero sounds better and more fitting for Mega Man. I don't know where that bomber nonsense came from, he hardly ever uses weapons I'd consider bombs. The Blue Blaster would have made more sense. The blue Rock 'Em Sock 'Em robot. Oh yeah, but still, that's like calling Zero the Red Rocker. Dammit, it actually works out. I think it has to do with the word "bomb" itself. I mean we live in a post 9/11 America here in the west and after Oklahoma in 1995, plus the suicide bombers in Iraq and Afghanistan during bush's invasion of both countries in the early 2000's, then Boston just not to long ago. I tend to think the word bomb doesn't sit well with your everyday American. Look at for instance mega man battle network cartoon where In America Bomb Man was called Blaster Man. Great theory, except for the fact that mini bombs (among other bomb types) are some of the most common battle chips, which got changed to mini boomers in the anime, which describes the same thing. Plus BeastMan-SavageMan (among other navis) getting name changes and such. Also BombMan.EXE is depicted with two big generic black ball bombs in his shoulders, and is usually stepping on another one, changing his name doesn't really solve the fact that he is all about bombs. My theory, the anime dub just changes stuff for the heck of it, like most televised anime dubs tend to do. It's worth noting that this isn't the only oddity with the differing English localisations of the current Smash Bros. games - for example, one entry on the roster (leaving out the name to avoid potential spoilers for those who haven't picked up the 3DS version and know this already) has "Duo" appended to their name in Europe, so it doesn't sound like they're awkwardly being referred to by a game's title, as is the case in the North American release where the name just sounds incredibly strange (exactly like calling Mario "Super Mario Bros."). There's probably nothing more to it than just another case of the two different English-language localisation teams making different choices when polishing up the base product. But Duck Hunt is a trio, as explained by Pit and Palutena. And The Blue Bomber is an American nickname not used in Japan, that was probably kept unchanged from the original source. 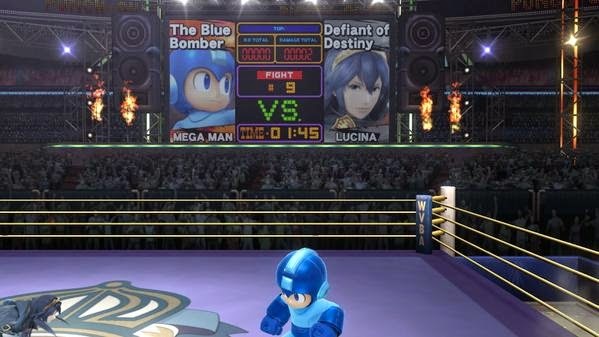 The MM10 challenge "Blue Bomber" is actually named "Blue Lightning" in Japan. Though it's still undeniable that "Duck Hunt Duo", referring to the fact there are two visible characters, sounds markedly less awkward than just calling them "Duck Hunt". It's like that old Tiger Electronics Mega Man 2 LCD game that refers to the character as "Mega Man 2" throughout the manual. "I'd wager we'll see the title amended in North America sometime soon"
That's pretty sad, really. While I also figured the Metal Hero title was in reference to Mega Man 8, your average fan probably wouldn't have any idea about it since it was only seen as Rockman 8's subtitle. Aside from the little homage, it's a rather generic name compared to his universal moniker, The Blue Bomber, or even Super Fighting Robot. You'd think the American version would have opted for that one. Meh.